Athletes, like all people, may have illnesses or conditions that require them to take a particular medication/substance or undergo certain procedures/methods. For athletes, the substance or method may appear on World Anti-Doping Agency (WADA)’s List of Prohibited Substances and Methods (List). In such instances, they may be granted a TUE, which gives them permission to take a substance or use a method. A TUE is granted to an Athlete under narrow, well-defined conditions. The TUE enables the Athlete to take the necessary medication while competing in sport Events, without resulting in a doping offence. TUEs are only granted by National Anti-Doping Organizations (NADOs), International Federations (IFs) and Major Event Organizers (MEOs)- following a robust review process that is defined in the International Standard for TUE (ISTUE). In order to obtain an approval for a TUE, athletes must have a well-documented medical condition supported by reliable and relevant medical data. National-Level athletes and athletes participating in National Events shall obtain a TUE from NADA, unless they have previously received a TUE from an IF and such TUE is still valid and its granting has been reported to the NADA. 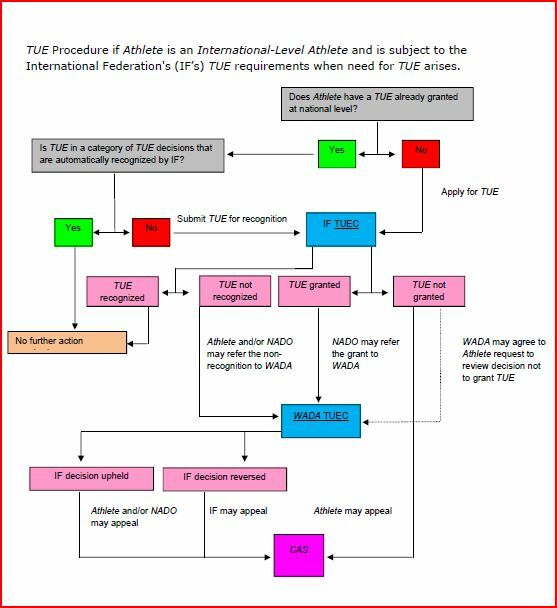 Athletes included by an IF in its Registered Testing Pool and other athletes prior to their participation in any International Event must obtain a TUE from their relevant. An IF can recognize a TUE delivered by NADA under its own authority. For more information on recognition, see ISTUE Article 7. Athletes who already have a TUE at the national level but are participating in an International Event and do not already have a TUE registered with their IF must request a TUE from the IF no later than 30 days before the athlete’s participation at an International Event. Athletes may be required by a MEO to apply for a TUE if the Athlete wants to Use a Prohibited Substance or Method in connection with the Event. He/she doesn’t already have one. If the TUE is granted, it is effective for its event only. 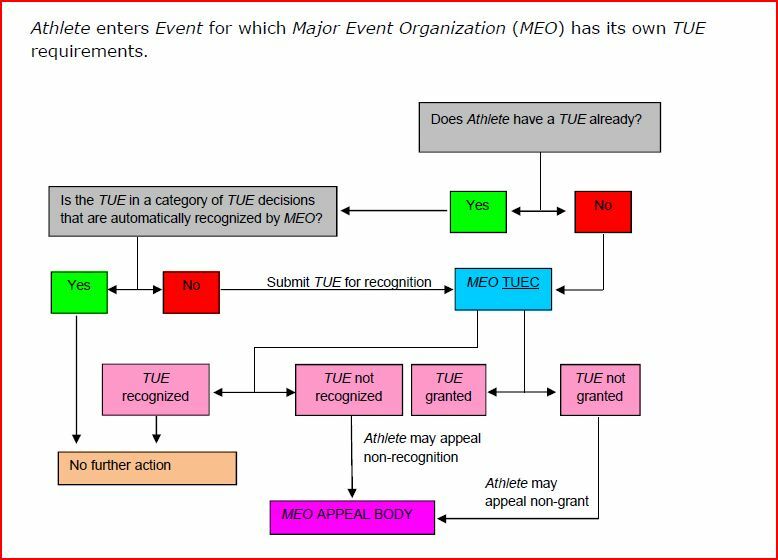 A decision by a MEOs not to recognize or not to grant a TUE may be appealed by the Athlete exclusively to an independent body established or appointed by the Major Event Organization for that purpose. TUE Process for athletes participating in event of MEO. If the TUE is approved, the athlete can only begin treatment and or sports practice after the reception of the authorization notice from NADA. (In rare emergency or exceptional cases, a retroactive approval may be considered). Athletes should not start using the substance before receiving the authorization notice from NADA. The athlete would then be using a prohibited method or substance without authorization and this could constitute an anti doping rule violation in the event that the TUE is denied by the TUEC. The Prohibited Substance or Prohibited Method in question is needed to treat an acute or chronic medical condition, such that the Athlete would experience a significant impairment to health if the Prohibited Substance or Prohibited Method were to be withheld (ISTUE Article 4.1(a). The Therapeutic Use of the Prohibited Substance or Prohibited Method is highly unlikely to produce any additional enhancement of performance beyond what might be anticipated by a return to the Athlete’s normal state of health following the treatment of the acute or chronic medical condition. The necessity for the Use of the Prohibited Substance or Prohibited Method is not due, wholly or in part, to prior Use (without a TUE) of a substance or method that was prohibited at the time of such Use. A TUE can only be granted if (and only if) all four criteria are fulfilled. A TUE for any Substances and Methods that are prohibited In-competition, has to be submitted by the athlete no less than 30 days before participating in an Event. In order to make sure that the Athlete has the TUE before participating in a competition all Athletes are strongly advised to send in their applications at least 30 days before participating in an event as the TUECs have 21 days to render their decision. For substances, which are prohibited In-Competition as well as out-of-competition, the TUE application has to be submitted as soon as the medical condition requiring the use of prohibited Substances and/or Methods has been diagnosed. There are some situations when retroactive approval can be accepted. Even if a potential retroactive case is given consideration, this in no way guarantees that the TUE will be accepted. The evaluation procedure is the same as for a normal TUE request. The request will be considered by the relevant TUEC who will then render its decision. a) A statement by an appropriately qualified physician, attesting to the Athlete’s diagnosis and need to Use the Prohibited Substance or Prohibited Method in question for Therapeutic reasons. b) A comprehensive medical history, including documentation from the original diagnosing physician(s) (where possible) and the results of all examinations, Laboratory investigations and imaging studies relevant to the application. Note: Athletes should keep a complete copy of the TUE application form, and of all materials and information submitted in support of that application. Incomplete applications will be returned to the Athlete for completion and re-submission. TUE application will be reviewed by the Therapeutic Use Exemption Committee (TUEC) of NADA. The athlete will be notified of the decision taken by the TUEC. Decisions of the TUEC, will be completed within 21 days of receipt of all relevant documentation, and will be conveyed in writing to the Athlete by NADA. The TUEC assigns each TUE a start and end date, upon which the TUE expires automatically. If the Athlete needs to continue to Use the Prohibited Substance or Prohibited Method after the specified end date, he/she must apply for a new TUE well in advance, to allow sufficient time for a decision to be made on the application before the existing TUE expires. TUEs cannot be renewed without a new medical consultation and confirmation thereof. This means the athlete must fill in a new request signed by his or her Physician upon expiration. Even in the case of chronic use, a TUE can only be granted for a limited period of time. The Physician provide recommended treatment. Automatic continuation is not acceptable in any case. The Physician must see the athlete on a regular basis and evaluate if the medical condition has changed and if the treatment is still appropriate for the stated medical condition. If NADA denies an application for a TUE, the Athlete may appeal exclusively to the national level appeal body described in Articles 13.2.2 and 13.2.3 of NADA Anti Doping Rules 2015. WADA shall review any decision by an International Federation not to recognize a TUE granted by NADA that is referred to WADA by the Athlete or NADA. In addition, WADA shall review any decision by an International Federation to grant a TUE that is referred to WADA by NADA. WADA may review any other TUE decisions at any time, whether upon request by those affected or on its own initiative. If the TUE decision being reviewed meets the criteria set out in the International Standard for Therapeutic Use Exemptions, WADA will not interfere with it. If the TUE decision does not meet those criteria, WADA will reverse it.